What do Bert & Ernie, Forrest & Jenny and Thelma & Louise have in common? They go together like a bowl of cereal and milk of course! 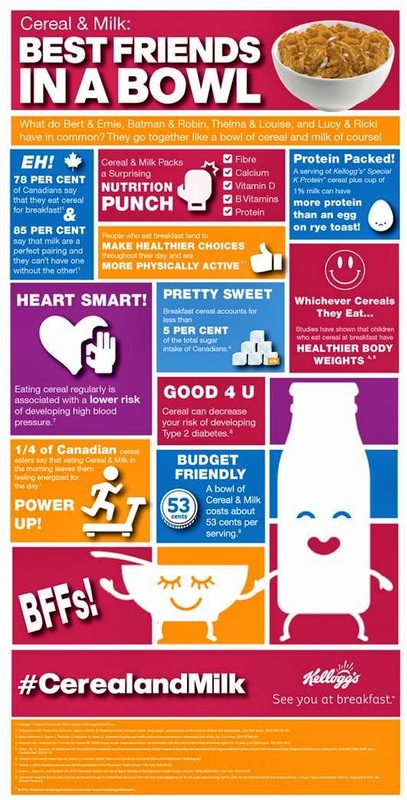 For the 78 per cent of Canadians who eat cereal for breakfast, cereal and milk are practically inseparable. In fact, according to the Kellogg’s Cereal & Milk Survey, 85 per cent of cereal lovers say they can’t have one without the other. Although it’s clear that Cereal & Milk are best friends in a bowl, the survey revealed that across Canada, star-crossed cereal lovers actually disagree on the ideal cereal to milk ratio. Forty per cent (40%) say that one third of the bowl should be filled with milk. Thirty per cent (30%) maintain that you should add milk only until your cereal begins to float. And a small but mighty six per cent (6%) of cereal experts are adamant that there should be more milk than cereal in the bowl. For more information, check out the Milk & Cereal website. 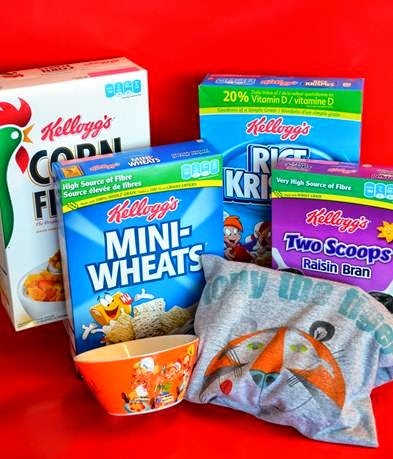 Kellogg’s cereals – all to celebrate Cereal & Milk! My kids usually have cereal and milk with juice or fruit. I usually have a smoothie or bowl of cereal. My kids usually have waffles or cereal with fruit. Hubby always has cereal. Toast, oatmeal, cereal or a green smoothie. My daughter has cereal, hubby and I don't do breakfast.. bad bad I know. Cereal, toast and juice most days. Bacon and eggs on the weekend! We start with a smoothie and cereal. Cereal, milk and toast most days. My kids eat waffles or cereal, bananas and milk for breakfast. my hubby doesn`t eat breakfest,,my son eats oatmeal/toast ,cereal/toast, pancakes,etc..and I can eat a variety of things,,anything really!! We have oatmeal or cereal, toast, fruit, yogurt and juice. We usually eat steel cut oats. We often have cereal and milk with a serving of berries or other fruit. Quick and easy! Cereal or toast with egg and cheese. We all eat a bunch of different cereals! My daughter has fruit, yogurt and sometimes toast/pancake/eggs. pancakes, french toast, scrambled eggs, breakfast wraps, anything that we have in the house. It depends upon the day but usually toast or cereal. Sadly to say the parents here are not big breakfast peeps. We usually have coffee or iced coffee and toaster strudels! mostly cereal during the week so it's nice and quick and on weekend eggs with different sides. We usually have toast, cereal and milk. We start our day with cereal. My family eats fruit loops every day in the morning. Our family enjoys cereal, or sometimes homemade pancakes for breakfast. I have a Carnation Instant Breakfast and fruit such as a banana or blueberries. My kids have cereal, either Raisin Bran or Cheerios, and fruit OR toast and yogurt (we usually alternate days). My husband has toast or a breakfast bagel/muffin. 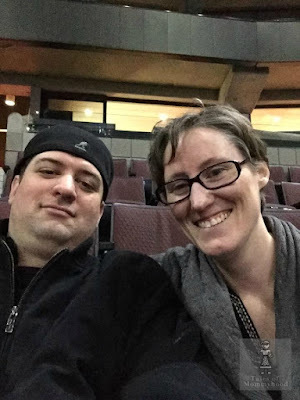 My husband and I always have boiled eggs, yogurt and orange juice. For breakfast, we have eggs, bacon and cereal! I have a shake and the kids have cereal. My family has cereal and fruit for breakfast almost every day. During the week we have cereal or toast with orange juice and fruit. We try to mix it up, but most days it is cereal or toast or yogurt. I eat hash browns with eggs over easy just about every other day. We usually have cereal and milk with fruit or oatmeal. We usually eat cereal for breakfast. Bailey Dexter Our family always has fiber & fruit in the morning, sometimes I sneak it into the homemade muffins if not then cereal! During the week we have toast or a bowl of cereal, on the weekends its bacon, eggs, toast. We usually eat cereal and toast. We normally eat cereal with milk but if my husband is home he makes us some sort of fancy breakfast. Always cereal of some sort, but usually healthy! We have cereal, eggs or bagels. Cornflakes are my favorite. my husband always has a huge bowl of cereal, with milk, fruit, honey and yogurt on top!